Feel like you eat all the time but are never satisfied? Take a hard look at your meal planning and caloric distribution. "Eat 4-6 meals per day to rev your metabolism and burn more calories." How many times have you heard that? Plenty, I imagine. In bodybuilding circles, this often gets expanded to 6-8 meals. I even saw a Mr. Olympia diet article where the reigning champ was eating 10 meals per day. I get the logic. More is better. Keep fueling the metabolic furnace. But do we? When a dietary system like this places such strict demands on our lifestyles, we need to re-examine our habits and the science that drives them. I found that fitness and bodybuilding people could benefit from eating less often, and people just starting out on their weight-loss or bodybuilding journey benefit from eating more often. But no matter which camp you're in, I recommend building an eating plan based around your caloric needs, rather than arbitrarily using a number you hear mentioned by someone else. How should you begin to do that? Let's break it down. Why Six Times Per Day? I'll be blunt: There's not really any good data supporting hyper-metabolic effects of multiple meals. One study published in International Journal of Obesity found that consistently eating more frequently—six times per day, to be specific—led to a greater "thermic effect" from food than eating sporadically. The thermic effect of food is basically the amount of energy it takes for your body to break down, digest, and process, the energy (food) you ingest. In this study, frequent meals were linked to a statistically significant increase in the thermic effect of food, e.g. calorie-burning, but it wasn't enough to draw significant conclusions in the realms of physique or body composition. Additionally, there wasn't anything in the study to indicate that eating three, four, or five meals were worse than six—only that it was better than "sporadic" eating. That is pretty much all the data you'll find on meal frequency and boosting metabolism. For this reason, I make meal frequency recommendations for my clients based on two major factors: protein synthesis and satiety. OK, so the science isn't there, but everyone else seems like they're doing it, so it can't cause any harm, right? If your goal is maximum protein synthesis, I think there is a definite downside to eating often. The first problem I see people run into when they eat frequently is that their blood amino acid levels are constantly elevated. In order to optimize protein synthesis you need to give your body a solid serving of protein which boosts protein synthesis and subsequently causes your blood amino acid (specifically leucine) levels to drop. To maximize synthesis, you should then hit your body with more protein while the levels are lower. If you eat non-stop—every hour or two—then you aren't going to experience the fluctuation in blood amino acid levels you need to optimize muscle growth. You need to space your meals out sufficiently in order to get the maximum amount of protein synthesis out of the food you eat. Another issue that you run into is meal size. On one hand, it's true that protein content plays a big role in satiety. Protein's presence in the digestive track triggers the release of the hormone cholecystokinin (CCK), which signals to your brain that you've eaten and should be satisfied. However, meal size has been shown to be more important than protein content when it comes to satiety. If you eat too often, your meals will be so small that despite being protein-rich, they won't satisfy you. So you're hungry—so what? Seriously, that is no way to live! If you're going to go to all the trouble to eat all those meals, you should at least feel full. If you don't, well, good luck sticking with your plan through the endless hours of prep and planning. How Frequent Is Frequent Enough? Some simple math can help us here. When looking to optimize anabolism and satiety, the number meals you eat throughout the day should be a divisor of the total amount of calories you eat. If you eat 3,000 calories per day, then breaking that into five 600 calorie meals would probably give you sufficient food to feel satisfied, while not demanding so much that you need to turn to lower quality foods in order to hit your per-meal calorie targets. On the other hand, if you eat only 2,000 calories per day, eating five 400-calories meals is not a satiating option, but eating four 500-calorie meals would be more filling. Each of these meals should contain a minimum of 30 grams of protein (the amount which research has shown is necessary to maximally stimulate protein synthesis). This pulse of protein can also be effectively spaced out and repeated throughout the day for the biggest increases in protein synthesis. If your calories are so low that you can't get 30 grams of protein at each meal, sprinkle on a little leucine or have a BCAA drink with your meal to cover your bases in the protein synthesis department. Remember when planning these meals that size is directly connected to satiety, so don't make them too small to be filling. 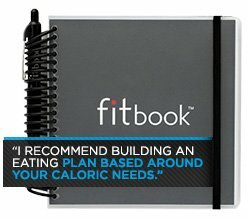 Not a big-time planner? You can still do this. 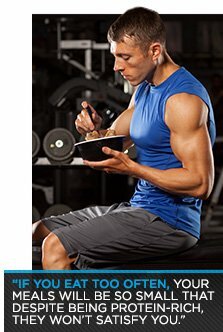 Just eat a solid, protein-rich meal every 3-4 hours, and you'll be more or less on track.